Abstract. Starting Comparative Heliobiology as a branch of general biology it is proposed that within the framework of rodent modeling of diabetes induced by streptozotocin it is useful to take into consideration effects of solar activity on the Earth. Principal component analysis of the solar magnetic fields is thought to be quite useful to establish links between the Sun and biological life on our Mother Planet. In the 20th century it was definitely and ‘1-level quantitatively’ found that solar activity affects all the biological life on the Earth. The pioneer in the Heliobiology science was A. Chizhevsky who began studying of ambient influence upon human health. He gave numerous examples of a relationship between changes in the activity of the Sun and the occurring of epizootics and epidemics and other biophenomena . For example, Chizhevsky found a relationship between changes in solar activity and the development of epidemics and epizootics, exacerbations of nervous and mental diseases, and some other biological phenomena (Fig.1). Fig.1. This Chizhevsky’s result is courtesy of . As it is seen variability of the solar activity is reflected by the variability of the “sunspots”, which can be defined as: “The various manifestations of solar activity are driven by the changing amount and distribution of magnetic flux in the Sun. Solar activity dynamics was first discovered through observations of sunspots. Reliable counts of sunspots, integrated into an index called International sunspot number or Wolf number (see Fig.3), date back from the present to at least the beginning of the 18th Century. In 1946, a better index of solar magnetic activity was discovered: the 10.7cm Solar Flux. This index represents measurement of radio emission from plasma concentrations formed in the solar corona by magnetic fields” . Some other correlations are Solar Cycle and Wars : “Evidence indicates that wars and international conflicts most often break out when sunspots are rapidly forming or rapidly decaying, as these are times when there are more intense geomagnetic storms“. "It is important to note that the main part of the known solar regulatory signals influencing Biosphere is of electromagnetic nature: - in the case of cycles of Solar activity it is alterations of the Earth’s Magnetic field, caused by fluctuations in levels of solar ionizing radiations and solar energy output (Fig. 2)" (cited ). Fig.2. Periodicities in solar (Sunspot Number) and geomagnetic activity (AP index). “The left panels show time series of the monthly values of the sunspot number and the geomagnetic Ap index. The top right panel shows the solar cycle variation present both in the geomagnetic and solar records, showing peak geomagnetic activity during the declining phase of the solar cycle. The bottom right panel shows the semiannual variation in the geomagnetic data not visible in the solar records. (From , reproduced by the kind permission of the author and the publisher. The source database: )” (cited ). Fig.3. Sunspot Number  to see that the solar activity is still at its lower level at the present time. The data shown by Fig.2 lead to conclusion that the Sunspot Number can not always sufficiently explain variability of the geomagnetic activity of the Earth magnetosphere (and living beings) hence additional predictive parameters are needed. From the last citations and the conclusion from no1 it can be derived that that the sunspot number is a kind of a “resulting” parameter of the magnetic fields of the sun, which are now precisely observed and measured, and caused by these magnetic fields is the solar wind delivering solar magnetic disturbances to the Earth magnetosphere. As a result, disturbed geomagnetic field influences all the life on the Earth. A nice review devoted to the problem is given in  published recently in 2010, which could be cited as “There are solar-interplanetary-terrestrial associations with human health versus disease, long claimed and descriptively documented by leaders of genius in the field of in the past, such as Chizhevsky (1921), and at present by Mikulecký (2007) and Ertel (1996). They recognized that health includes economic, political and climatic well-being and that all aspects of the biosphere depend on weather on earth and in space”. A problem was formulated several years ago (in 2003) at MBARI (Monterey Bay Aquarium Research Institute) : Why the population of fish (sardine and anchovy) in the Pacific is being dramatically altered? Researches concluded: "Fish in many parts of the Pacific are marching to the same drummer. This same drummer is causing changes in ocean circulation and in the global carbon cycle. What we've been trying to find out is, what is the drummer, and is the beat going to change?" (Fig.4). Fig.4 (Upper panel). Fish regimes . “This graph shows how the Pacific Ocean has alternated between “sardine regime” and “anchovy regime” over the past 70 years. These two regimes involve not just fish, but changes to ocean currents and the atmosphere across the entire Pacific Ocean” (courtesy cited from . Fig.5 (Right panel). Measured Solar Northern Polar Field Strength (up to 2 Gauss) (thick line) from 1976 to 2011 (courtesy of ). The thick curve showing the magnetic field strength nicely resembles the variability of fish populations (Fig.4), but with the about 2 times higher frequency. So, it could be concluded that “the drummer” is the Sun and its “drumsticks” are its magnetic fields. “The ecological factor influencing on variability of bacteria has apparently an electromagnetic nature. Probably, the great value has increasing of geomagnetic micropulsations (0,2 - 5 Hz)” (cited from ). It was found that life ability of bacteria changes when the polarity of the interplanetary magnetic field delivered by the solar wind changes its sign. It was recently found that wild animals get sick during decline phase of the solar activity (see Fig.3). Some of the diseases are related to the bacterial colony growth this time. For example, bats are “dying in great numbers across 10 states from a spreading fungal disease known as White Nose Syndrome” . So, “At the Graphite Mine in the Adirondack Park -- formerly the largest bat hibernation site in the state -- the survey found the population of Little Brown bats declined from an estimated 185,000 in 2006, when the disease first broke out in a Schoharie County cave, to just 2,000 bats four winters later. … There is no known technique to protect the bats from infection” (cited courtesy of ). It was discovered that genes in living beings are influenced by magnetic fields. A review with studying influence of magnetic fields on gene expression in cells is given in , for example. Paying attention to the Rodent model for diabetes it was recently recognized that a weak pulsating magnetic field can serve as a treatment for “Streptozotocin (STZ)-induced acute and chronic diabetic rats” (cited courtesy of ). As it was mentioned above, the solar activity is reflected by the Sunspot Number. At present time it is occurring to be almost a single (“the One and the Only”) integral parameter often not being sufficient predictive variable to define disturbances in the Earth magnetosphere (for example, see Fig.2). Different approach to estimate the solar activity is considering the variability of principal components (PC) of the large scale solar magnetic fields using a statistical approach . In the next figures shown are observed magnetic fields of the solar photosphere  and reconstructed using four PCs  (Fig.6, 7). These figures look alike. It means that the main features of the fields are preserved only by four parameters. 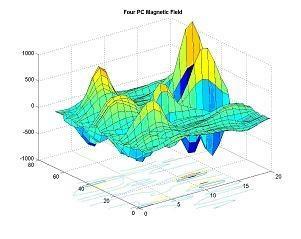 These PCs are orthogonal (in mathematical sense), so every of the PCs contains different statistical information of the fields’ magnetic energy and hence various sets (of one to four and more) of the PCs could be used in evaluating schemes of forecasting field variability. Fig.6. Observed solar magnetic fields for one solar rotation CT1662 (27 days), data of . Fig.7. Fields built on the set of four PCs [15, 17]. As a conclusion it is supposed that more detailed analysis of correlation between the solar activity and health/diseases in living organisms can be obtained using the above mentioned technique to describe solar magnetic fields. is related to the four-sector structure of the interplanetary magnetic field [19, 20]. The Sun rotates once about 27 days, so 27/4 is approximately equal to 7-day period. One of the goals is to obtain forecasting schemes of initiating (and curing) diseases in rodents on the solar activity using the principal component analysis of the solar magnetic fields. The point is whether to start modeling a certain disease using some technique (i.e. a drug injection method, for example) on a given day of the year or not to be in success. Other goals are under formulation. Let us suppose, for example, a researcher wanted to continue to work with the mouse diabetes model on December 7, but the forecasting data based on the PC1 (Fig.8) showed that this disease would be initiated only with probability of 0.25, but one week later it would start with the much higher probability of 0.8 (Fig.8). Consequently, it was worth to delay the modeling for seven days until Dec 14 (saving probably processing time, drug and money). Fig.8. Calculated Principal Components for the CT1662: PC1 (blue) and PC2 (green) using data . Artificial Frequencies of the STZ-induced diabetes in mice (red triangles). Data of initiating certain disease including the dates of such initiating, failure and success in starting the disease are needed to get appropriate statistics. Solar data concerning magnetic fields are needed, too. They can be found on the Internet (). 1. A. Chizhevsky The Terrestrial Echo of Solar Storms, 366 pp. 1976, Moscow (First published in 1936). 2. F. Halberg, G. Cornélissen, K. Otsuka, G. Katinas, and O. Schwartzkopff, Essays on Chronomics Spawned by Transdisciplinary Chronobiology. Witness in time: Earl Elmer BAKKEN. 3. http://www.mdpi.com/1660-4601/7/3/938/pdf (definition of sunspots and influence of magnetic field on genes, Int. J. Environ. Res. Public Health 2010, 7). 5. Pulkkinen, T. "Space Weather: Terrestrial Perspective". Living Rev. Solar Phys. 2007, 4, 1. 6. Geomagnetic data. Available online: ftp://ftp.ngdc.noaa.gov/STP/. 8. www.zsf.jcu.cz/jab/9_1/cornelissen.pdf (Cornelissen’s rev., J Appl Biomed 8: 1–40, 2010). 10. http://cifa-icef.com/faraone_eng.pdf (Geophysical Processes and Biosphere, 2005, V 4, No.1, p. 89-97). 11. http://www.timesunion.com/local/article/Bat-disease-rages-unchecked-in-New-York-and-beyond-806992.php (Fatal bat disease raging in state By BRIAN NEARING Staff Writer Published: 04:27 p.m., Wednesday, November 10, 2010). 12. http://www.ncbi.nlm.nih.gov/pubmed/19593780 (Mert T, Gunay I, Ocal I. Neurobiological effects of pulsed magnetic field on diabetes-induced neuropathy, Bioelectromagnetics. 2010 Jan; 31(1):39-47). 13. Shukhova, L. Z., M. I. Pudovkin, V. D. Zholudev. Indices for the large-scale solar magnetic field, Geomagn. Aeron., 31(1), 122-125, 10.1029/91GA00256, 1991. Copyright 1991 by the American Geophysical Union. 15. Shukhova, L Z, V D Zholudev, On Transverse Components of the Large-Scale Solar Magnetic Fields. Inverse Problem, Eos Trans. AGU, 85(47), Fall Meet. Suppl., Abstract NG31B-0880, 2004. 18. G. Cornélissen and F. Halberg, Introduction to Chronobiology. Variability: from foe to friend, of mice and men (online:http://www.msi.umn.edu/~halberg/introd/index.html ). 20. V. V. Vasil’eva, V. I. Makarov, and A.G. Tlatov, Astronomy Letters, Vol. 28, No. 3, 2002, pp. 199–205 (Online: http://www.springerlink.com/content/70n4188133241567/fulltext.pdf).